Sensory stimulation that calms instantly. Fill the Pat Mat with distilled warm water. Soothe the aches of stiff, arthritic hands. Add cool water to make a hot afternoon more enjoyable. Provides hours of independent activity. 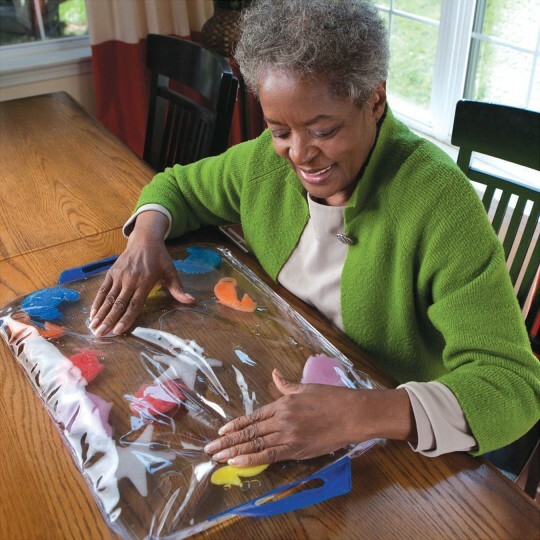 The perfect sensory stimulation aid that offers an almost instant calming effect. Just fill the Pat Mat with distilled warm water and soothe away the aches and pains of stiff, arthritic hands or add cool water for a more enjoyable hot summer afternoon. Can provide hours of independent activity. Features a drainage plug for filling and refilling. Measures 16" x 22". I fill the mat with warm water every morning for my residents. It feels so good on their hands. Anybody who has arthritis it is so comforting and soothing.Make sure to place the nozzle side down on the table. This is safer for anybody with Alzheimer's or dementia. My residents are loving the Pat mat .. it is great for the ones that need their attention diverted at times. It does hold their attention for long periods of time. We use this at our adult day care many love these especially when filled with warm water. our consumer enjoy using this product.